The other night found me in the kitchen with a bigger loot of local produce than normal–cleaned up on greens at the market last week–but with a need to use up the last of my roasted pumpkin puree before it bit the dust. And, since I was feeling under the weather, I wanted an easy option, and an easy option, invariably, means soup. Hearty, simple soup. 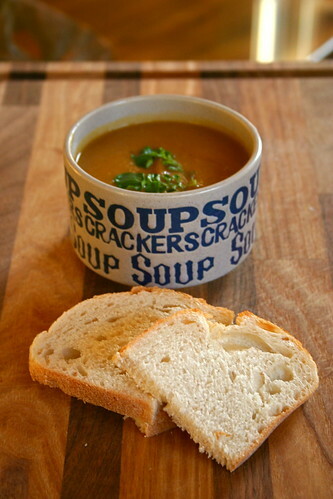 And what says winter better than a bowl of soup with some crusty bread? The inspiration came from Sprouted Kitchen’s recent post on Balsamic Roasted Root Vegetables and, while I adore balsamic vinegar, I never use it enough, and the thought of it paired with roasted veggies sounds perfect! So why not roasted vegetable soup with balsamic vinegar? And what goes better with balsamic vinegar than roasted garlic? G, at first, was skeptical of the combo, but agreed that it turns out to be a very vibrant soup, and one with some interesting and surprising notes–sweet tang from the balsamic vinegar, deep and hearty notes of pumpkin and turnip, mellow richness from the roasted garlic. It all adds up somehow. Now it just needs a witty name. Anyone, anyone? Pumpkin: from Good Food Good People, Floyd Co.
Garlic: from Good Food Good People, Floyd Co.
Chop the top bit off the head of garlic. Place in tin foil, pour olive oil over it, and cinch up to make a packet. On a baking tray, place the turnip pieces and drizzle with olive oil. Toss to coat. Place the turnips and the garlic in the oven and roast until the turnips are soft when poked with a fork and the garlic, when the foil is opened and the garlic is poked with a fork, soft. This takes 20-35 minutes, depending on the size, etc. Check every little while. Remove the garlic and turnips and set aside to cool for 15 minutes. In a food processor, place the turnips and pumpkin puree. Slice or squeeze each clove of garlic free from its paper and add to the processor. Process for 1 minute, until everything is beginning to blend. Add the coconut milk and vegetable broth. Process another 1-2 minutes until everything is smooth. Transfer the soup to a pot on the stove, bring to a boil then lower to a simmer. Add the paprika and sage, as well as 1/2 tsp salt. Stir. Add 2 tbsp balsamic vinegar, stir to combine. Let simmer for 5 minutes; stir periodically. Taste the soup. Add more salt and balsamic vinegar to taste and continue to simmer at least another 10 minutes. The longer it simmers, the saltier it will become, so be sure not to over-salt. ALL ABOUT SOUP. Especially this one. I was thinking about your Dark Days challenge today at the farmer’s market! I definitely saw tons of turnips I could have roasted but this is way nicer than anything I could have come up with! My boyfriend insists on adding balsamic vinegar to most everything; I’m sure he’d appreciate this. YUMMO! And I’m laughing because I feel the same way about my recipe titles! Finally, a good-sounding use for turnips! Yum! Love the use of balsamic, I often forget to add a dash of acid! This soup looks delish!